SU-type all-metal slide. Removable air bleeds. No accelerator pump. Central aircut valve. 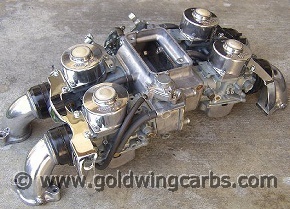 Same carb family as CB450, originally sourced from Honda's N600 car. Heavy zinc content and very prone to corrosion and pulled threads. Wonderful "time machine" carbs though! SU-type all-metal slide. Non-removable air bleeds. Accelerator pump. Four individual aircut valves. 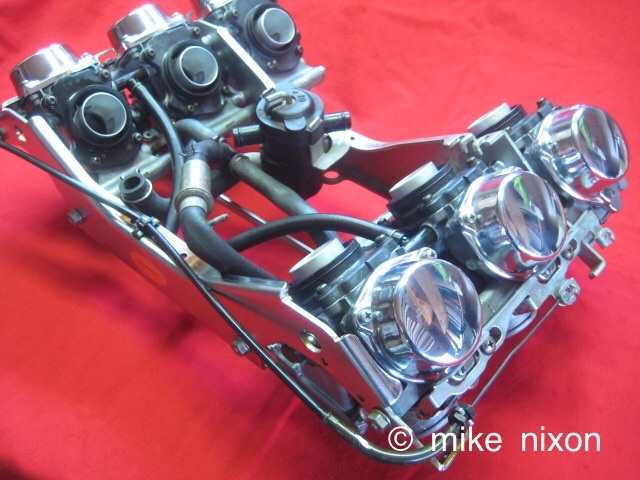 Same carb family as CX500, DOHC fours, CBX. 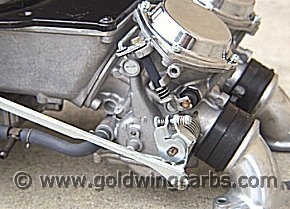 A higher grade alloy than the GL1000, so less susceptible to casting issues, but a more complex carb at the same time. Really nice carbs! Stromberg type diaphragm slide. 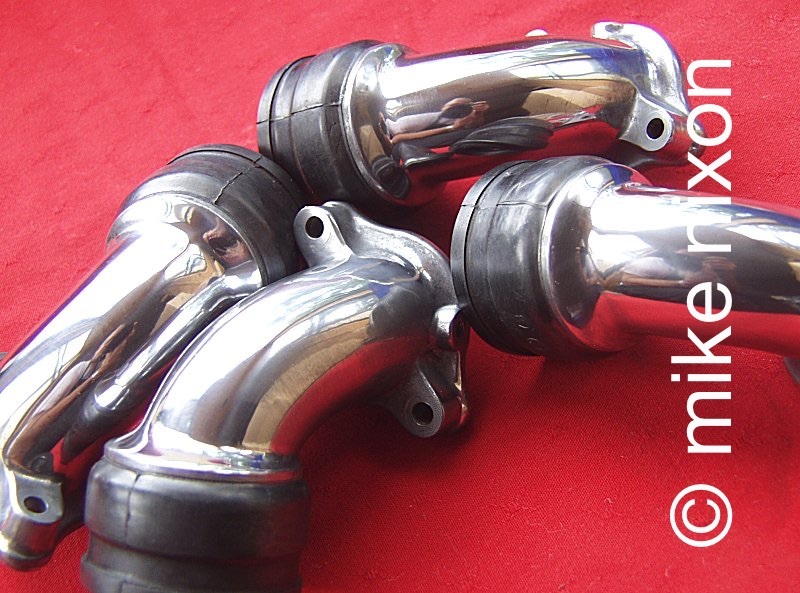 A high performance semi-downdraft carb related closely to that on the early V4, and close to the last series of production Keihin CVs. Great performing carbs! Same carb family as early 1990s Honda sport bikes except two not four, and full downdraft instead of side draft. Unusual side-mounted accelerator pump, dual spray nozzles, Very car-like and ugly, these work very well! Same carb family as later 1990s sport models. State of the art production Keihin CVs. No accelerator pump, semi down draft. Beautiful and great performing carbs! 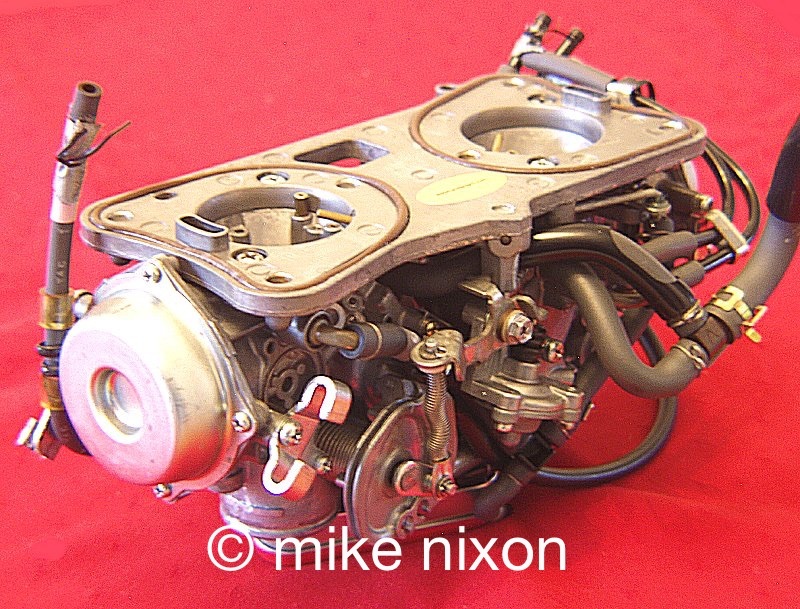 Each few years Honda made these carburetors smaller and smaller. Yup. The 75-77 carbs are the largest, then the 78-79 shrunk a little, the 1100 series are smaller yet, the 1200 are tiny compared with the original Wing, and the 1500 intake area is absolutely miniscule for six cylinders. This progression in increased intake airspeed follows the Wing's evolution from sportbike to unmistakable touring platform. First of all, please use my shipping checklist. Next, realize that 90 percent of performance problems on points ignition bikes are related to the ignition. And it isn't enough to check timing, though that is important. If you haven't serviced the ignition system and/or you have Diachi points in there, you have no business trying to solve running issues with carburetor work. Take care of the basic stuff first. 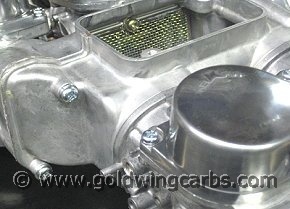 Once that is put to bed, along with cylinder compression, only then turn to the carbs. Drain them well, and include in a baggie any loose pieces. Please advise me of any modifications to the motorcycle, type of air filter used, traditional fuel mileage, and be sure to aprise me of the specific performance issues you have been experiencing and what if anything has been done so far in response.